Godzilla Against MechGodzilla wasn't as successful as GMK, but it wasn't a failure, either. So Toho decided to plot along with the same director, and essentially, the same plot. This is also the only film of the Millennium series to be a direct sequel to another film of the same series. Our first monster on-screen is Mothra. Again ignoring the Rebirth of Mothra series, Mothra looks much like it did for Godzilla vs Mothra, although it can apparently fly as trans mach speeds. Mothra is no longer sleek and combat-oriented, but again hairy, as she was in her original film. If this is to make her sympathetic, I'm not sure. With her are the shobijin, who shows no signs of having a wicked triplet. The shobijin contact Dr. Shin'ichi Chûjô, played by Hiroshi Koizumi forty years after he first performed the role in Mothra in 1961. They want Godzilla's bones to be returned to the sea. Less than ten minutes after the film begins, so do the plot problems. The shobijin want Japan to decomission Michagodzilla. When Kaneko's nephew reples that it is their only defence againat Godzilla, the tiny fairies promise Mothra will protect Japan from Godzilla. So where was she the whole last film? Worse, if the humans do not do this, Mothra will declare war on them. But this ultimatum is forgotten as soon as it is spoken. Mechagodzilla has been nerfed a bit, and is still under repairs from the damage taken in the previous film. The absolute Zero chest cannon has been replaced with a more run of the mill triple hyper maser. But here it also serves as a bone of contention. It is made from Godzilla's remains, the Shobijin want returned to the sea. Giant turtle Kamoeba, from the obscure Space Amoeba washes ashore, letting everyone know that Godzilla is on the prowl again. Apparently, writer/director Masaaki Tezuka originally wanted this to be Anguirus, but Toho said no. It would have been oddly appropriate, since the cranky old dinosaur's last appearance was the first Godzilla vs Mechagodzilla, back in 1974. Apparently, Toho worried about the audience's reaction to Godzilla killing one of Godzilla's oldest friends. Which is odd, because not two films ago, Godzilla disintigrated Mothra, who is now back. Where the military has been primarly lionized in the previous Masaaki films, here the vibe is avery different. Are the bones of Godzilla attracting Godzilla? Is military build-up inviting military attack? Godzilla appears for the first time attacking an American nuclear sub, as in Godzilla vs King Ghidorah and The Return of Godzilla. But is the submarine an innocent victim, or should have it not been there in the first place? The film moves back to Ishiro Honda's attitude, that the military is there for show, but it almost completely ineffectiver against Godzilla. There are some very striking shots of missiles streaking across the Tokyo skyline, and the Hyper Maser is cool-looking, but none of these weapons do much more than inconvenence Godzilla. He sweeps away a phalanx of tanks with a single jet of his atomic heat ray. Godzilla looks much the same as he did in Godzilla Against Mechagodzilla, bvut he has a large scar on his chest. So Godzilla is not invulnerable. But Kiryu no longer has the Absolute Zero gun, which caused the injury. A lot of story beats and plot points are taken directly from Ishiro Honda's Godzilla vs Mothra, which is a little weird since that film doesn't exist in this continuity. In the initial confrontation, Mothra uses its poison scaled on Godzilla, which haven't been used since that 1964 film. But Chûjô was not involved in that, Lahtough actor Hiroshi Koizumi played the part of Dr. Miura) so I wonder how he knows about the scales. Again, for the first time since Honda's 1964 film, The Mothra larvae are twins. Godzilla's defeat is the same. Although Mothra can't take Godzilla down, the two larvae are able to, coating Godzilla in silk. This flies in the face of the shobijin's promise. Mothra can't handle Godzilla on her own. Mothra, who really hasn't had much religious symbolism since her debut, is at least willing to sacrifice herself for her children, taking a direct blast of Godzilla's atomic ray protecting her children. It plays out rather like her sacrifice in Godzilla, Mothra and King Ghidorah. The shobijin get a moment in front of a fallen cross, saying that the living should not touch the dead. Godzilla: Tokyo SOS is fairly remakable in that there is only one monster showdown. The fight is on-going, and the human action is intercut with it. Again, Mechagodzilla proves to be Godzilla's greatest for, battering him around, knocking him down once. It's not as harsh as the job done by Mechagodzilla II, which temporarily cripples Godzilla. And ultimately, it's very inconclusive. The Mothra Laevae do the heavy lifting. Ultimately, I struggle to remain interested in the film. The human drama isn't all that compelling. While it was nice to engage someone who wasn't (initially) a pilot, focussing instead on a technician. But he doesn't have much to work with. When Mechagodzilla goes down, he goes ouyt to fix it. Not a lot of character depth there. The Godzilla problem is ultimately solved as Kiryu takes it upon itself to fly Godzilla's silk-enshrouded form to the ocean. The humans do not prodice a solution. It's all done by the Mothra larvae and Kiryu. The protagonists are really just spectators. In two weeks, the Kaiju Blender, love it or hate it. Godzilla, Mothra, King Ghidorah, Giant Monsters All-Outr Attack made the most out of any of the Milennium films, but director Shûsuke Kaneko was not a long-term Toho player. So for the next film, Toho reinstated Masaaki Tezuka, whose Godzilla vs Megaguirus was underwhelming, but he'd shown willing by demoting himself to visual effects director under Kaneko. Clearly, he learned a thing or two. Godzilla Against Mechagodzilla is more family-friendly than GMK, but it lacks the dullness of Godzilla vs Megaguirus, even as it uses a nmber of the same story elements. Godzilla Against MechaGodzilla opens in the Godzilla-significant year of 1999. The impossible future of Destroy All Monsters, the return of Godzilla in Godzilla 2000 (1999 in Japan), the date of the MUTO attack in 2014 Godzilla. In this 1999 backstory, Godzilla attackes Japan, and our military heroine is blamed for the deaths of her superior officers. And we see them die as Godzilla plants a gigantic foot on them. This "Godzilla kills people" attitude is lighter than it was in GMK, but it's still effective in making Godzilla a menace. Also, showing the audience a refugee center where people whose lives have been broken by Godzilla's rampage is a nice reminder that smashing buildings isn't just fun, although it's softened a bit by a soldier's polite response to a little boy's kind offering. As with Godzilla vs Megaguirus, the military is again valorized. They undertake the rescue missions, and they ate the ones who will stand against Godzilla. The Anti-Godzilla force is the Anti-Megalsaurus Force, so not specifically about Godzilla, but various monsters that have attacked Japan. Somewhat in keeping with Godzilla's metaphor as force of nature, Godzilla comes ashore during a typhoon. The flashback takes place entirely durng a heavy rainstorm, and it looks good, grounding the encoutner in the real world. With foreground and middleground, the battle looks a lot less like it takes place on a small soundstage. Pacific Rim also set a major encounter in the rain during the Battle of Hong Kong. In a very nice homage to War of the Gargantuas, the maser cuts the top off several trees before connecting with Godzilla. After the attack is over the (female!) prime minister of Japan tells us where we are, discussing the variou8s monstersd that have attacked Japan in the past. The film picks and chooses which of Toho's films it wants to include in its past. Footage from 1954 Godzilla, the original Mothra, and War of the Gargantuas (all Ishiro Honda classics) shows us why Japan has heat rays and maser weapons. In a clever subversion of the original Godzilla, the bones of Godzilla are shown after it is dissolved by the Oxygen Destroyer. This was not in the original film, but Dr. Serizawa's fish were reduced to bones when subjected to the Destroyer. Godzilla itself has returned to the long-spined creature from Godzilla 2000, rather than keeping the dead-eyed GMK version. The major change seems to be that Godzilla's jaw is more slender, birdlike. I don't know why, but this trend continues until Godzilla: Final Wars. This also introduces a new concept with Godzilla's spines. Previously, they just glowed when Godzilla breathed his heat ray, and in the Milennium series, they did so before, demonstrating a sort of power up. Now they make a popping sound, as if a connection were arcing, as they light up fitfully, almost like a cold incandescent light. It's wonderful, creating anticipation for the powerful atomic heat ray. And there's a light touch of the atomic bomb metaphor, also. The Prime Minster tells the press that Godzilla has attacked Japan twice, a parallel to the two nuclear bombs that were dropped on Japan. Godzilla's foe is sort of himself. MechaGodzilla this time is based on Godzilla's bones and DNA. The appearance is refined from the previous outing with Mechagodzilla, (leaving aside MOGERA). While this Mechagodzilla is not the meshing of two separate vehicles, it still has the two guns that project over its shoulders. It also has the Absolute Zero Gun, a nod to another Honda film, Atragon. Like many ultimate weapons, it has a long warm-up time, allowing the target to dodge. Gypsy Danger's Plasma Gun had this problem in Pacific Rim. Kiryu is a drone, like the Super X-2, remote-controlled from the White Heron craft, large vector-thrust planes rather like the Griffon from Godzilla vs Megaguirus. Clearly, director Masaaki learned something from working on Godzilla, Mothra, and King Ghidorah, Giant Monsters All-Out Attack, because the fights carry a great deal more weight and plot importance. Godzilla is more often shot from a low angle, giving him the sense of size and power he had in GMK. the integration of the miniatures with the regular shots is much improved, also. The first confrontation between Kiryu and Godzilla is pretty good. It's primarily a stand-off, with Kiryu firing a huge amount of missiles at Godzilla. 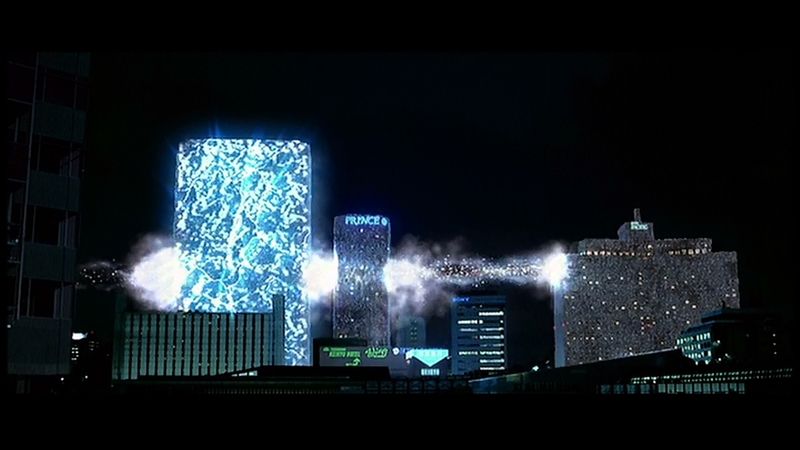 About to use teh Absolute Zero Gun, Kiryu, which is run by a Godzilla-derived DNA computer, hears Godzilla's cry and begins to level the city it's standing in. Unfortunately, there's no off-switch, so the only thing the military can do is wait for its batteries to run out. Godzilla Against MechaGodzilla recycles a lot of the same ideas as Godzilla vs Megaguirus. The military brings in a civilian with technical expertise, who has a flirty relationship with the damaged woman fighter pilot. Part of the plot invoplves repairing damaged code for the anto-Godzilla superweapon. But there are other elements that give this a more unique flavor. When Mechagodzilla is approved, reporters demand to know where the Prime Minister thinks she will get the money. Godzilla has certainly become more threatening since Godzilla vs Megaguirus. In its third and final attack, it sweeps the sky of planes. A shot where Godzilla advances toward the camera, a burning plane falling out of the sky just in front of him is particularly effective. Godzilla is unstoppable, the risk is so great that Kiryu must again be deployed. The resulting fight is a winner. Every fight should be a story with a beginning, a middleand an end. Otherwise, it's just action without putpose. Godzilla is a known quality, and Kiryu must do everything it can to keep away from Godzilla's heat ray. Kiryu, however, has a lot of surprises. It has a blade that it uses to stab and then electrocute Godzilla. This works until Godzilla uses its heat ray to destroy the blade and knock Kiryo down. Mechagodzilla would have gotten a faceful of atomic ray if one of the White Heron aircraft hadn't intervened. The reversals convey a sense of tension, we don't know who is going to be the winner, but it's fun to watch them go at it. It gets a little goofy with Kiryu swinging Godzilla by the tail, but this is intended as a kids film, a double feature with Hamtaro. Mechagodzilla finally gets the Absolute Zero Gun off, but misses, desttoying three buildings instead. Oops. So the film does not universally valorize the military. Military mistakes are shown to be costly. In the end, Kiryu is flown out over the ocean, holding Godzilla's mouth closed, charging the Absolute Zero Gun. They dive into the sea, and the Gun goes off, turning the sea to ice. Godzilla rears back, still alive, but with a large wound on his chest (this will become a plot point in the next film). Deciding he's had enough, Godzilla turns his back on Japan and returns to the sea. Michiru Ôshima apparently felt her score was drowned out by the monstrous sound effects in Godzilla vs Megaguirus, but no problems here. Her score is one of the best, rich, threatening, and thrilling. Godzilla Against Mechagodzilla is a step down from GMK, but it's also a big step up from Godzilla vs Megaguirus. The Godzilla sequences are rewarding and entertaining. Even if the human interaction is flat and facile, it's not insulting or idiotic. It's a good entry into the franchise, entertaining. Next up, the MechaGodzilla and Mothra gang up on poor Godzilla. With the commercial failure of Godzilla vs Megaguirus, Toho looked around for ways to save their beloved franchise. But by this time, they had other irons in the fire. Toho was distributing anime. including Studio Ghibli and the Pokemon franchise, as well as producing low-cost, high return J-horror such as Ring and Pulse. If Godzilla could not perform, then perhaps it would have to be laid aside for a time. To avoid this, they tapped Shûsuke Kaneko, who had done a brilliant job revitalizing the Gamera franchise, to helm their new Godzilla film. This turned out to be a smart move. As with previous and subsequent Millennium films, Godzilla, Mothra, King Ghidorah, Giant Monsters All-Out Attack (hereafter GMK) occupies its own continuity. The first Godzilla film is acknowledged, but the other twenty-four are not. Except for the moment when the film casts some shade on the 1998 Godzilla. We begin with a lecture. Commander Taizô Tachibana is talking to a group of students about the function of the Japanese Self-Defence Forces, which has only been tested against Godzilla. Although this film closely engages the character of the admiral and the military, it does so with a very different bent than have previous Godzilla films. Neither there for a useless show (the Showa series), a serious challenge (any film in which MechaGodzilla is built by humans, including the next two films in the Millennium series), or bumblers causing as much destruction as the monster (Godzilla 1998) the military here is neither valorized nor there for comedy. They are treated as people. The man put in charge of the anti-Godzilla task force is a blustering foot-dragger, refusing to believe that Godzilla is even real at the beginning, and spouting inappropriate military doctrine ("Try attacking it from the side! It must have a weak point!") while his men get killed. Taizô Tachibana on the other hand, is very much a lead-from-the-front sort of man, who takes responsibility for his actions, and decides to do the dangerous mission himself. He does not relish the thought of combat, and admits to being afraid just before he goes into battle. it is not the military as a whole that this film praises, but the resonsible individuals who do their duty. At the same time, GMK is well aware of its roots. the Japanese Self-Defence Forces help search for a downed American Nuclear Submarine (shades of The Return of Godzilla) with a new submersible called the Satsuma, a callback to both the man who performed as Godzilla in the Heisei series, as well as the rescue ship from the first Mothra film. When Godzilla comes ashore, we get a quick glimpse of a picture of Lucky Dragon #5, the fishing boat that was contaminated after the Castle Bravo nuclear test. Whwen Godzilla uses its atomic ray for the first time, a teacher looks out to see a mushroom cloud. It's the second most chilling moment in the series, after the crying woman and her children in the first Godzilla. It reminds the modern viewer of a time when Godzilla meant something. The other protagonist is Yuri Tachibana, Taizô's daugher, a reporter, one of the classic Godzilla roles. But in a subversion of the usual Showa roles, she is a sensationalist reporter, working on bogus supernatural stories. This makes her earnestness in wanting to cover real stories, the story behind the guardian monsters all the more powerful. Perhapsd the earnestness of the character grew from director and writer Kaneko's years of making soft-core romance films for Nikkatsu (the studio that had once produced Gappa the Triphidian Monster). Kaneko has also brought with him several of his own ideas from his Gamera trilogy. There are good kaiju and bad kaiju. Godzilla is a radioactive lizard infused with the angry spirits of the dead from World War 2. Mothra, Ghidorah, and Baragon are beneficial guardians, equivalent to Gamera. But although they are beneficial, they are still giant monsters, and they kill, even if by accident. The first casualties of the film are a group of obnoxious motorcyclers, crushed in a tunnel as Baragon tunnels by. Originally, Kaneko wanted the guardians to be Baragon, Varan and Anguirus, but Toho, remembering the poor return from Megaguirus, insisted their two most popular kaiju, Mothra and Ghodorah, be used. And it works, Ghidorah is the thousand-year dragon, and Mothra started out being worshipped as a god. Which brings some interesting images to mind. I would have liked to see Varan arise in glory after being charged up the way King Ghidorah was. The guardian monsters also appear to be moral guardians. The above-mentioned obnoxious bikers break a statue, and get crushed by Baragon cruising by. A group of looters disturb one of Mothra's guardian statues, and they are pulled under the water one by one. Godzilla, on the other hand, does not discriminate. People who are in his way die. Further, there's a lot of confusion as to what's going on among the film's characters. With only second hand reports, the military cannot determine which monster is which. It's thirty minutes into the film before the military believes that there's more than one montser. There are no grand overarching shots that show them which is which. Meanwhile, civilians constantly underestimate the deadliness of the monsters. A pair of tourists want selfies in front of the Godzilla and Baragon fight. They don't make it out alive. Godzilla looks very different here than he did in the previous two Millennium films. He is no longer lean, but almost bloated, his eyes dead white, his snout blunt. The spines are blunt, also, not the long starp ones Godzilla is an ugly brute. He is not a force of nature, not the hero, but a furious engine of destruction, crushing everything in his path. The monster fights are spectacular. The first one is Baragon against Godzilla. Godzilla is enormous compared to Baragon, and the entire thing is a beat-down. Baragon is clearly outmatched, but it will not give up its attack. Godzilla fires off its atomic heat ray, and Baragon disintigrates, leaving Mothra and Ghidorah to fight Godzilla. Mothra ahs changed a bit since her appearance in the Hesei Godzilla vs Mothra: Battle for the Earth. It's not as aggressive-looking as the last Rebirth of Mothra, and that's a bit unfortunate. The later evolutions of Mothra were very dynamic looking, with straight leading edges ion their wings. This is a step backwards toward the traditional Mothra, admittedly the one that nearly took Godzilla to the cleaners in Godzilla vs Mothra. But she's less fussy than she has been, not as much a nurturing monster as something that does look ready for a fight. Further, she's been equipped with a battery of stingers, so she does not have to rely on the poisonous scales. Ghidorah is much the same, if a bit smaller smaller he has been. It does take on a couple of power-ups in the course of the fight. The second battle, with Mothra, Ghidorah, and Godzilla in Yokohama, is one of the best kaiju battles ever put to screen. Godzilla is a brute, smashing everything. When Mothra attempts to lansd on a tall building that happens to contain soldiers, Godzilla sends its atomic ray through it, killing the men, destroying the tallest building in Yokohama. After the first ten minutes, the fight is no longer shot over complete buildings, but the rubble of structures already destroyed. This helps with the overall sense of dark weight this film has. Men are being killed, buildings are being destroyed, and this is reinfoced by repeated viewings, giving the destruction a sense of permanence. Godzilla, while it has its teeth in one of Ghidorah's necks, casually swats Mothra aside with its tail, a move borrowed later in Godzilla 2014. When both Mothra and Ghidorah go down temporarily, the military moves in. While the display is impressive, it only attracts Godzilla's destructive attention. Godzilla sweeps his atomic ray across the men, annihilating entire platoons, then blowing a destroyer out of the water. From the smoking shore, Godzilla roars his triumph. But at least it keeps Godzilla from destroying the helpless guarsian monsters. Very seldom have human and kaiju worked in such good harmony. Mothra, wings on fire, confronts Godzilla again, only to be disintigrated by a close-in blast. Like Biolante, she disintigrates into golden particles. These flow into the downed Ghidorah, who awakens, now with a forcefield surrounding it like a clould of electrons. Godzilla lays into this with a long blast of its heat ray, but Ghidorah collects the energy and returns it to sender in a gigantic ball of destructive energy. At last, Godzilla is wounded. This doesn't prevent him from unleashing his ray on Ghidorah, and creating a frikkin' huge explosion as the three-headed monster disintigrates. With the Guardians gone, Tachibana pilots his submersible literally down Godzilla's throat, and relesases the drill torpedo from inside. Godzilla collapses and sinks, pouring blood into the water. Attempting to use its heat ray, Godzilla manages to destroy itself, leaving only a heating heart at the bottom of the bay. The film is political, and I'm not steeped in Japanese culture enough to honestly reflect on Japan's relationship with World War II. But Kaneko is clearly making a statement that Japan is in denial of its responsibility for many deaths in the Pacific during that conflict. Far from destroying the film, which was released as a double-bill with Hamtaro, an animated film about a hamster, this is the most successful film in the Millennium series. Despite, or perhaps because of the layers of subtext, this is one of the best Godzilla films out there. The dark edge appeals to me, and the extended monster fight at the end of the film is everything I could ask for. The writing isn't embarassing, there are no random experts who show up with impossible answers, the characters are well drawn. Shûsuke Kaneko turned Gamera from an extended Mystery Science Theater 3000 gag into an excellent trilogy of kaiju films. He brings the same love and devotion to kaiju film making here. Visrually, the story is exciting and Godzilla is seen with a badly-neede fresh set of eyes. Of further note is director's excellent choice for score. Kô Ohtani has worked with director Kaneko on his three Gamera films, and the score is excellent. Unlike Michiru Ôshima, who provides a full orchesttral score, Ohtani gives us something a little more electronic, but it's a thrilling, beautiful bit of work. Godzilla, Mothra, King Ghidorah, Giant Monsters All-Out Attack was a financial and critical success, considered by myself and many other fans as the best of the series. So naturally, Toho returns back to, director of Godzilla vs Megaguirus for the next film.